There are primarily two kinds of studies when it comes to birds. The more scientific pursuit is the realm of ornithologists, professionals who’ve devoted the last two centuries identifying, affixing binomial names to each one and further dividing them into more specific genus names, as well as all aspects of biology related to these winged creatures. Then there’s the popular amateur field of bird watching generally undertaken by lonely spinsters and socially awkward people, err… intellectually curious nature lovers who’ve contributed a great deal to the understanding of birds in their native environments. In our field of choice there’s a similar duality at play. You have musicologists who study the form in a scholarly manner and ethnomusicoloists who do the same as it relates to culture, which is kind of what we do here, minus the pretension I hope. But then you also have the amateur ranks who are, in this case at least, ironically also called birdwatchers. …Well, at least those in a smaller subset who are most interested in the surprisingly deep field of 1940’s and 1950’s “Bird Groups”. One look at the artist name tells you which field we’ll be covering in this review. The arrival of two vocal groups in consecutive years gave rock ‘n’ roll its first documented case of a growing cult. When the founders of the rock vocal group style burst onto the scene in 1947 in the form of The Ravens it was a momentous occasion. Not only did it immediately expand the types of musical approaches that would be housed under the genre’s umbrella which helped guarantee rock’s long-term survival by not being forced to stick to one narrow unchanging definition of what qualified as rock, but it also gave the new movement its first national hit record when Write Me A Letter cracked the Billboard charts in January 1948. A few vocal groups followed but mostly they were crossover acts from milder pop approaches who merely displayed a more soulful vocal style for their occasional rock forays and even then the results of these stylistic hybrids was usually far too compromised to work to the satisfaction of the new fans they were attempting to court. That changed when The Orioles flew into sight. A younger act without the experience of having broken in under the existing rules of pop sensibilities to be forced to shed The Orioles succeeded right out of the gate by utilizing lead singer Sonny Til’s wracked emotionalism. His distinctive style gave them a perceived authenticity to the younger rock crowd and made them immediate stars, rivaling and even in a way surpassing the ever-so-slightly older Ravens for supremacy in this still small field, at least when it came to the utter devotion of their respective core fans. But what was notable beyond the success and the stylistic shifts employed was the fact The Orioles were also named after a bird. It was silly of course to think this meant much beyond a group seeking a catchy and mildly relevant name (they were from Maryland whose state bird was the oriole… and it was also a much easier name to remember than their previous Vibra-naires moniker). Yet it also connected them ever so slightly to the dominant group on the scene… The Ravens. Whether intentional or mere coincidence it was notable, but didn’t mean it was the start of a trend or anything. Until The Robins came along and made one that is. The fact that The Robins had been created to specifically capitalize on the popularity of The Ravens meant that the name used was going to try and emphasize that. Johnny Otis, who put them together, had given them the name The Four Bluebirds for their work behind him on My Baby Done Told Me but that was done without the group’s consent and so when they then headed to Aladdin on their own the next month they chose the name The Robins and with it set the “bird group” phenomenon into motion. Over the next decade similarly conceived groups flocked to rock ‘n’ roll – The Larks, The Sparrows, The Cardinals, The Flamingos, The Crows, The Wrens, The Falcons, The Meadowlarks, The Blue Jays, The Pelicans, The Eagles (not THOSE Eagles from the 1970’s), The Jayhawks, The Five Owls, The Ospreys, The Swans… there was even The Buzzards and The Penguins, not to mention The Feathers, The Five Wings and an unsubstantiated urban legend that The Drifters chose that name after finding it in a book on birds! When a second group of Falcons took perch in rock at the end of the 1950’s it brought to a close a decade of like-minded species in rock ‘n’ roll. All were descended from The Ravens and Orioles, but it was The Robins who signaled this was something more than just coincidence. More than any other of these winged creatures The Robins were the most similar to The Ravens in terms of sound – we’re talking singing groups now, not birds. The Ravens use of bass vocalist Jimmy Ricks out front had been revelatory but few acts had anyone in that range with the skill to pull it off. 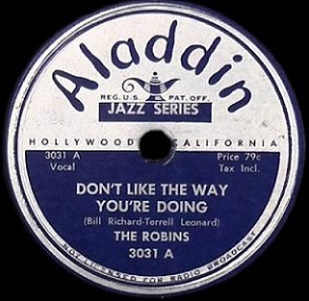 Bobby Nunn wasn’t quite in Ricks’ class – nobody ever was in Jimmy Ricks’ class truthfully – but he was more than capable of handling leads and would do so exclusively for The Robins until the arrival of tenor Grady Chapman in 1952 allowed them to switch off lead vocal chores for different types of songs. 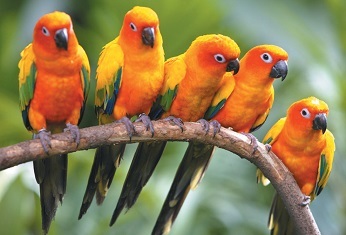 Quite naturally during this formative period The Robins were going to be taking the basic formula of The Ravens and try to fly on their own, sticking to the prototype hopefully without descending into exploitative impersonators merely parroting the more popular group at every turn. To that end the title – Don’t Like The Way You’re Doing – could very well be the words spoken by fans, who rejected this as too imitative, or it might be the same line The Ravens themselves issued upon hearing these guys trying to ruffle their feathers. In fact upon hearing this playing in the summer of 1949 without seeing the record itself a rock fan would naturally think it WAS The Ravens, albeit captured on a bad day. That’s not to say The Robins sing badly, but rather they don’t sing up to the standards of The Ravens. Jimmy Ricks of course was incomparable, we’ve already made the claim that he’s among the names who could legitimately be considered among the handful of all-time great singers in rock history and we’ll stick by that statement with no reservations. Bobby Nunn may be pretty darn good in his own right but it’s just not a fair fight. When you’re intentionally doing all you can to suggest someone of Ricks’s stature in not just the way you sing but also the way you present yourself and the group in terms of personality you’ve set yourself up to be criticized for your shortcomings in that regard. The other Robins aren’t as good as The Ravens either which does them no favors, although they too are more than acceptable in their roles, employing a fine group vocal to deliver the lead lines which Nunn then answers on his own. The trading off works well, ensuring that neither is responsible for carrying too much of the load themselves, and it also allows you time to focus on which of the voices you prefer without letting the others wear down your patience. There’s some similarities here to past Ravens performances too that you need to come to grips with, although to be fair they don’t rip-off any of their records right down the line. Certainly The Ravens themselves were more guilty of copying their own songs from time to time than The Robins could be accused of doing here, but that said you’ll hear echoes of Leave My Gal Alone at points along with a half dozen other moments that work their way into the song. But The Robins deviate in one notable way which is the ponderous pace they employ throughout. It’s a sleepy sounding record, one that may literally have you nodding off if you go into this with even the slightest drowsiness from whatever work or play you’ve been up to before settling in to listen, and that distances it from The Ravens who tended either slow things down to the point of crawling for Ricks’s honeyed tones to work their magic, or have far more spry melodies for him to use his full arsenal of suggestiveness. Rarely did they split the difference and have something medium tempo for him to sink his beak in. As such Don’t Like the Way You’re Doing comes across as a Ravens pastiche turned inside out. It’s asking a lot of audiences who tended to hear these records on jukeboxes rather than own them outright and be able to listen to them at their leisure as many times as they wanted, to remember each of The Ravens melodic approaches and to be able to see how this one differed just enough to make it sound somewhat original in spite of itself. But even if you weren’t inclined to cut The Robins much slack, since this was clearly modeled from the same clay in spite of the slight changes, that doesn’t mean the end results aren’t modestly enjoyable in their own right. Surely since The Ravens themselves were still torn between appealing to you as a rock fan with their more wicked vocal style and appealing to the supper club audiences with their more pristine pop balladry there was plenty of room on the jukebox for The Robins to give you something which was aiming squarely at your tastes. In fact you could even call it refreshingly welcome considering the record industry as a whole has still yet to afford your tastes the respect they deserve. As long as even the indie companies who are far more reliant on your pocket change to pay their bills than the major labels ever will be are trying to hedge their bets, too often striving to reach the larger pop marketplace, in effect taking your buying habits for granted rather than actively seeking to satisfy your interest with their output, then finding The Robins sitting on your windowsill singing in a style you best appreciate isn’t reason to chase them away simply because they’re imitating another bird. Which brings us back to a point we touched upon last time out with them, namely the fact that The Robins were yet another example of the generational progression that takes place in any larger movement such as rock ‘n’ roll. The Ravens, despite their innovation and brilliance in this field at times, were still drawn to (or at least comfortable in) the styles of the recent past, when they themselves came of age. By contrast The Robins had come of age not with that previous generation acting as their role models, but rather with none other than The Ravens themselves as the type of group that made the deepest impression in their formative years. It’s not surprising that when deciding what approach to take themselves they’ll stick with the Ravens rock sounds, the stuff that was meant for their generation as listeners. Now that they, The Robins, were making records themselves their work would be dissected by the kids a few years younger than they were who in the near future would take those sounds and craft them within the confines of their own bird groups. Each stop along the way the previous cutting edge sound gets relegated more and more to the past. The Ravens are the ones benefiting from those entering the music industry today while the previous generation stars like The Ink Spots are now put away on the shelf. In a few years The Ravens will join them there and after that The Robins will as well. The progression never stops. Don’t Like The Way You’re Doing isn’t as good as The Ravens best work, just as The Robins themselves aren’t as talented overall, but what matters going forward is how they’ll be going just a little bit further stylistically than The Ravens will be comfortable doing. 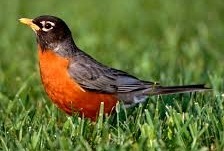 For the sound of mid-1949 The Robins are still taking a back seat, especially as they’re trying to replicate the sound of the biggest birds in the sky. Tomorrow though, as they start to work out their own sound more and more, they’ll be the ones flying just a little bit higher heading into the next decade. Leave a reply on "The Robins: “Don’t Like The Way You’re Doing”"